Another hot and humid day out, about 93 degrees today. Had to have some work done on one of the stand up showers, replaced the caulking around the seals. Did some laundry for Mom and that was about it today, too miserable to go outside. 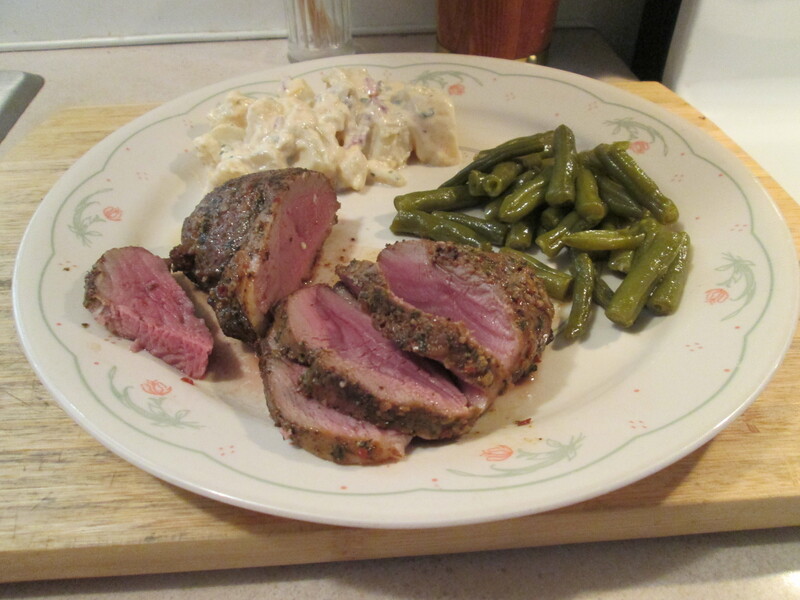 For dinner tonight another new one, Roasted Garlic Boneless Duck Breast w/ Cut Green Beans and Baked Potato. While at Kroger yesterday noticed a new item in their Meat Department, Maple Leaf Farms Roasted Garlic All Natural Boneless Duck Breast. I haven’t had Duck since my Grandmother prepared a whole Duck one time for Christmas, and that was in the 70’s or early 80’s. So I love trying out new food items, had to grab a package. It’s an individual packaged Duck Breast and comes seasoned, this ones Roasted Garlic. They had 2 or 3 different kinds but the Roasted Garlic sounded the best. It’s the first time I’ve prepared Duck, so just hoping for the best! To prepare it I just followed the instructions on the package. Thaw duck breasts and remove from package. Pat duck breast dry with paper towels. Trim skin to the shape of the meat. Score skin into 1/4 inch intervals. (Do not cut into breast meat). Rotate breast and score again, making a criss-cross pattern. Season with salt/pepper or preferred seasoning/marinades. Preheat griddle to 325 degrees F or nonstick pan to low-medium low. Place breast skin-side down for approximately 8-12 minutes or until fat is rendered and skin is crisp and brown. Low and slow is the way to go. Turn breast over and cook 1-2 minutes. Place duck breasts in 400 degree F oven for 3-4 minutes. Let product rest 2-3 minutes before slicing. Final internal temperature should be 165 degrees F. It came out one moist and delicious Duck Breast! I had seasoned it with just Sea Salt and Black Pepper and that’s all it needed. I’ll be purchasing the Duck Breast again soon. For one side dish I heated up a can of Del Monte Cut Green Beans. Then I also had some of the leftover Potato Salad from last night’s dinner along with a slice of Klosterman Wheat Bread. For dessert later a bowl of Breyer’s Carb Smart Chocolate Ice Cream. USDA inspected all natural boneless duck breast is marinated with the robust taste of roasted garlic that complements and enhances the delicious natural taste of duck. Available in a see-through package. Follow package directions or watch our duck breast preparation video. INGREDIENTS: Boneless Duck Breast, Seasoning (Sea Salt, Dehydrated Garlic, Turbinado Sugar, Hickory Smoke Powder (Malttodextrin, Natural Hickory Smoke Flavor), Spices, Dehydrated Onion, Yeast Extract, Dehydrated Red Bell Pepper, Dehydrated Parsley, Natural Smoke Flavor, Natural Flavoring), Water. Thaw duck breasts and remove from package. Pat duck breast dry with paper towels. Trim skin to the shape of the meat. Score skin into 1/4 inch intervals. (Do not cut into breast meat). Rotate breast and score again, making a criss-cross pattern. Season with salt/pepper or preferred seasoning/marinades. Preheat griddle to 325 degrees F or nonstick pan to low-medium low. Place breast skin-side down for approximately 8-12 minutes or until fat is rendered and skin is crisp and brown. Low and slow is the way to go. Turn breast over and cook 1-2 minutes. 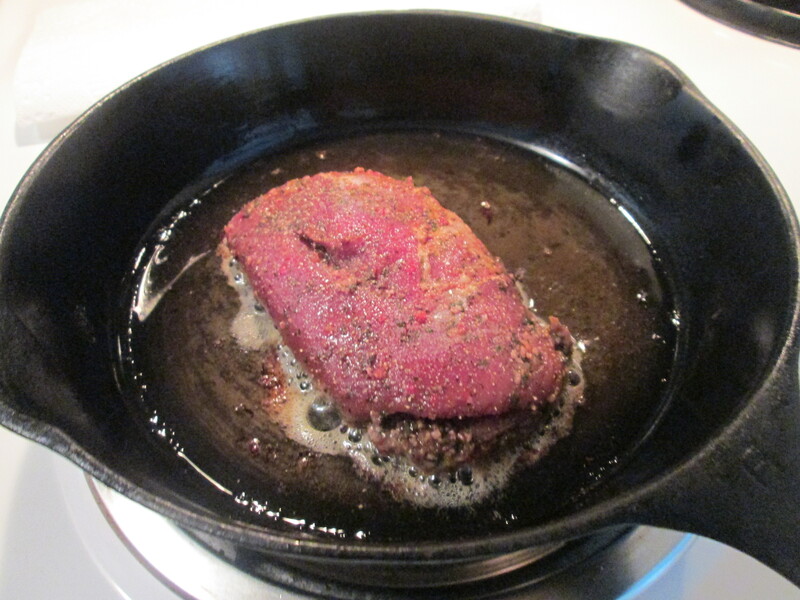 (Duck breast can be refrigerated at this point, then finished at a later time.) Place duck breasts in 400 degree F oven for 3-4 minutes. Let product rest 2-3 minutes before slicing. Final internal temperature should be 165 degrees F.